The Rocks is a lovely part of Sydney to wander through the cobbled streets. I love to imagine what life was like for the settlers who lived here in the 1800s, the wealthy and the poor, all trying to eke out a living in this tough and foreign land. Mum and I visited the National Museum of Contemporary Art with the intention of seeing an artist Mum had encountered in France, but unfortunately the exhibition he is in does not start until later in April. After our stroll through the galleries, we needed to refuel on a dreary day so we walked through The Rocks and stumbled across The Fine Food Store. The menu grabbed our attention and we were both able to find something delicious to savour while we sat at the bench to people watch (one of our favourite things to do!) 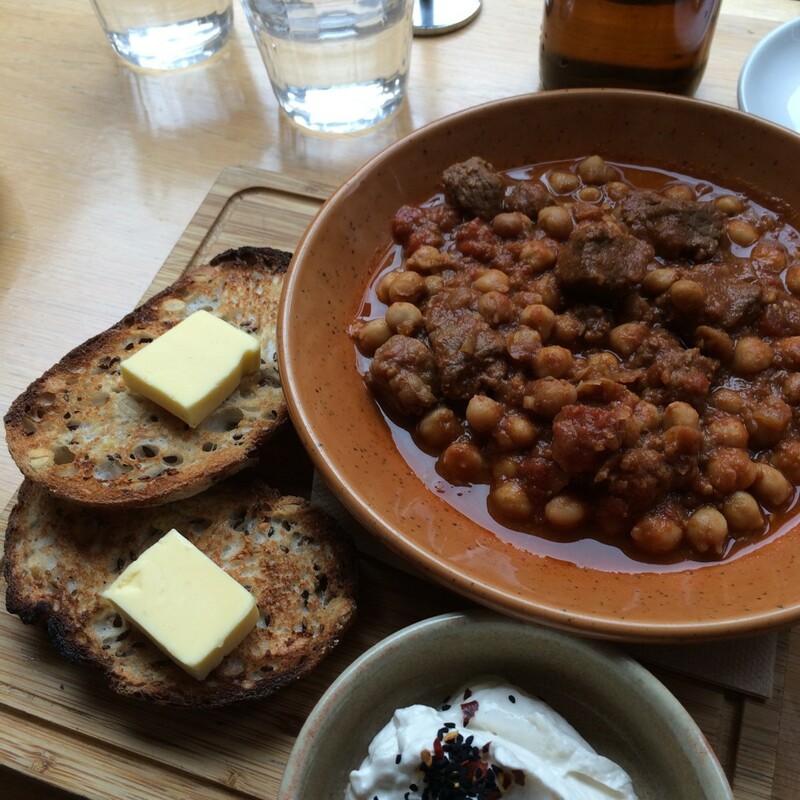 The lamb and chickpea stew I ordered was delicious, wonderfully spicy with a thick yoghurt and (cold) toast with plenty of butter. Mum ordered the quesadilla and thoroughly enjoyed the textures and flavours. I was expecting average tourist fare given the location, but this place is a real find in The Rocks. Quality food in a lovely spot which is slightly away from the hustle and bustle. I may have taken a photo of the menu with the intention of recreating some of the other dishes on the menu. Look out for my take on spicy baked beans with chimmichurri sauce soon!